I've always been interested in rocks and gemstones. Even as a small child I would frequently pick up a pebble or two and put them into my pocket. My American Indian heritage (1/8 Cherokee and Cheyenne) gives me a love and appreciation for our Mother Earth, and for the beautiful stones that God created within Her, among other natural beauties. As a young adult I collected specimen rocks, geodes, and crystals, as well as books about different types of rocks and minerals. The knowledge that I acquired led me to write a booklet entitled Biblestones, which received a copyright in September of 1995. In my early 30's I began making jewelry for myself, and for gifts. I received enough compliments to encourage me to sell my creations at local craft fairs. 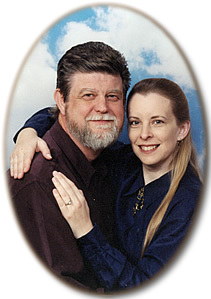 At the age of 40, I married my best friend, Roland Case, who has a similar interest in gemstones. About the same time, I was diagnosed with Autonomic Neuropathy (the nerves in my lower legs cause me severe pain whenever I try to walk, stand, or sit upright for extended periods) which put a halt to my profession as a Licensed Funeral Director. Having to spend most of my time in bed, one of the few things that kept me going was making jewelry. My husband, who supports my hobby, encouraged me to start selling my wares on the internet, and his daughter put this site together for me. Over the past 10 years I have rescued and re-homed over 100 Guinea Pigs, various Gerbils, Hamsters, and Mice, a 3-foot long Iguana, and several Parrots. I fostered a Miniature Poodle and a Dachshund, and rescued a Dalmatian mix, a deaf Bichon Frise, and a blind Shih Tzu. My love for my animals gave me a reason to get up in the morning. I offer jewelry making classes at $45.00 per hour, I can do some minor jewelry repairs, and I can give free evaluations of most jewelry types. Please inquire about any of these services. For my jewelry, I prefer to work with natural gemstones because they are a part of the Earth, and with freshwater pearls because they are each a one-of-a-kind creation. To ensure the best quality, I travel to an International Gem and Jewelry Show in Chicago, Illinois, to hand select the beads and pearls that I use. I hope you find something to your liking, and thanks for choosing Jean's Rocks and Gems.